Honiton Sea Angling Club was formed in September 1993. The first meeting was at the Three Tunns Public House in Honiton and from there the club was born. Meetings are now held at the Honiton Con Club on the third Thursday of each month at 8pm. Members are welcome to come along as are any new members. One thing is for sure is that you will be made most welcome. Our 2019 sign on night will be at the Con Club on Thursday 3rd January. 8pm. The Wyvern Region is part of the Angling Trust area that our club belongs too. The Wyvern area stretches from Weymouth up to Brean Down and down to Looe in Corwall and up to Crackington Haven on the North coast, the Channel Isles are also included with us. In all there are around 40 angling clubs in the Wyvern Region. The committee are made up from a wide base of clubs and they meet around six times a year for meetings. They hold three open events each year and they are the Junior Open, the Salcombe Small Boat event and the Senior Shore Open event. They also hold a very popular presentation evening each year at Exeter, to award their cups and trophies. Clubs in the division can join in with the fish of the month competition, this would cost each club £10 a year to join and it runs from October through to September each year. More details on Wyvern activities or if you would like to join us and help our local Region get better call Mike Spiller on 01404 43397. 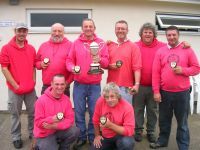 Honiton Sea Angling Club have always been a member of the Angling Trust, those that can remember back to 1993 and the first meeting, Ted Tuckerman came along to start of the club and give a short talk. All at Honiton SAC would like all sea anglers to join up to the Angling Trust and fight for our sport. Please visit the Angling Trust website for more details. Or even better come along and join our club, we will join you up to the Angling Trust if you want too. We will even do all your paperwork for you.